It is time to really get to know your vehicle. You need to know two things to ensure you get an exact fit when ordering seat covers and other custom accessories. The first is the exact year, make, and model of your vehicle. The second is its seat configuration. People often make mistakes with this information – you can avoid errors by taking a few minutes to get to know your car. First, make sure you know the correct year, make, and model of your vehicle. Don’t remember exactly what you’ve got? What model or what year? Don’t worry. Every vehicle has a unique barcode called a VIN code – it’s easy to find and you can identify the model with this code. The VIN code is most prominent on the driver’s side dash under the windshield. Enter the VIN code into the VIN decoder app and you’ll see the info for your car – or use a free mobile app to scan the barcode which is even quicker. For iPhones and iPads, use the VIN Viper app. On Android, try VIN Viper or Vinny apps. You can use the VIN to double check the vehicle details when you’re unsure of its exact model or year, but at ShearComfort.com we don’t actually require it during online ordering. Another good way to confirm your model is to open your glove box and check the registration papers. Usually, your vehicle’s year/make/model info will be listed there. Some sites will also ask for your sub-model, option package, or vehicle trim. You might as well have this info on hand, so you won’t need to head back out to your car if it’s required. Already know your car’s year, make, and model? It still doesn’t tell you the most important thing: the seat configuration. Did you know seat choices often vary, even within the same model year? Before shopping online, take a close look at your seats and take a mental note of how they’re set up. Better yet, you can take a quick photo of each row of seats with your phone and have it handy when you are placing your order. Things to check for: Do you have adjustable headrests, thin outer armrests, a center console (opens up, has storage space), an inner armrest (also in the middle, flips down from seat for resting your arms)? Do your seats have built-in side airbags? Can the passenger seat only fold forward a bit or does it actually fold down 90 degrees to be completely flat? If you have a bench seat, do you know what kind of bench it is? Is your bench split 60/40 or 40/20/40? Those numbers are just industry terms for percentages of width – for example, a 50/50 bench is split into two equal width pieces. If you have a 40/20/40 seat configuration, you should know whether there’s a storage drawer built in underneath the middle 20% piece. This area can go by different names: “lockable under-seat storage” “center locking under seat storage”. 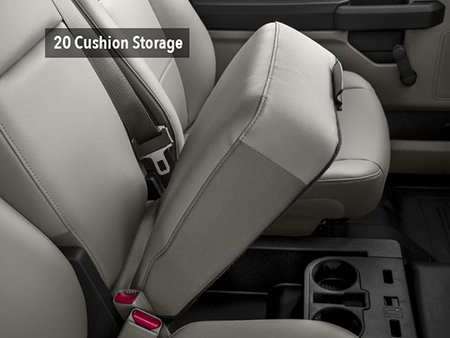 We call it “20 Cushion Storage” in our seat listings. It’s very common to be unaware of this feature on your vehicle – so don’t feel bad if you have it and did not know about it. There are some sites out there that can help you figure out your seats and have auto interior photographs to compare. While there are a number of different ways to try and figure out what you have in your vehicle online, it is always better to ask someone who knows about seat covers specifically. Our sales agents are very knowledgeable and will be able to determine your seat configuration. Just give us a call at 1-800-663-7750 and we’ll help you out. Knowing your vehicle and seats will make it easy for you to order custom made seat covers. Now that you know exactly what your seat configuration is, you’re ready to start your product research and browse through the various choices out there. Try the vehicle search on our home page to see what we can custom make for you.